The longest running non-traditional program we have is our Artificial Insemination (AI) program. The JHL has utilized AI on replacement heifers for more than fifteen years. Between the quality of many of the resulting progeny and the ability to track sires, by 1999 we were convinced to begin using A.I. on a segment of our mature cows and have since migrated to AI for almost the entire cow herd. All cows are individually mated based on their track records in providing replacement heifers and on the rail. Proven sire progeny are continually compared to our pasture bred calves in categories from heifer replacements to hanging carcasses. 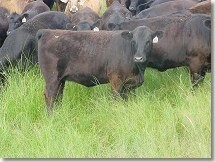 We are continually sampling bulls, relying more heavily on bulls that have proven themselves in our herd. Even though bulls are necessary and an individual bull, with AI, can have an immediate impact on a large number of animals, the JHL believes that the cow is the cornerstone of beef production. Probably the most critical time and place in the entire cattle industry is when females are selected to replace or build a herd. The potential lifespan of a cow positions her to provide consistent trans-generational genetic input. The major cost in the industry is the cost of developing and maintaining a cow. Choices made in cow selection influence a herd's personality, profitability and product for years. Tracking commercial cows has been pretty much uncharted territory. Many producers collect data on their cows and calves. This process is the most time consuming part of "knowing" cows. Usually frustrating, data collection takes patience and truly unique skills in two entirely different arenas - one is collecting the data live at chuteside and the other is deciphering it at the desk. Some producers have also gone the next step and summarized their data. There are a number of commercial software programs available to enable data collection, provide summaries and some specific animal analysis. Unfortunately both the data collection and the software provided summaries are all for nothing UNLESS the information enables one to make management decisions. Data can enable a better understanding of the cows in the herd. All the time and energy spent on data collection is worthless unless the data can be formatted to provide useful decision-making tools. The JHL has used skills brought from the corporate world to take full advantage of the data gathered. Until recently about the only hard numbers or tools available to cow/calf operations were calving percentages and weaning weights. Today the opportunity exists, as never before, to know what is being produced and how to manage it. One of the world's most renowned business thinkers, Peter Drucker, has stated: "If you can't measure it, you can't manage it." There are now many new ways for the producer to measure their cattle. The cattle industry is becoming vertically integrated - except for the producer,. Yet the producer is making the genetic (breeding) decisions that affect the potential in the entire process including what ends up on our customer's plate. Shouldn't it be critical that producers know their herd, what genetics they are adding, and the resulting impacts on their operation and end product? This is why measurements have been incorporated into the JHL program and why this website was developed.